Her posthumous collection Lioness: Hidden Treasures, which features original tracks and covers, was released last Monday and has sold more than 194,000 copies. An inquest found the 27-year-old star was more than five times the legal drink-drive limit when she was found dead in her home in Camden, north London, on July 23. 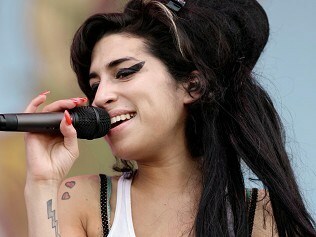 Some of the proceeds from the album will go to the Amy Winehouse Foundation, set up in her name. Winehouse displaced Olly Murs, the 2009 X Factor finalist, who topped the chart from The Official UK Charts Company last weekend with In Case You Didn't Know. He slipped to number four, with Michael Buble's Christmas remaining at number two, and Heaven by Rebecca Ferguson entering the chart at number three. Rihanna's Talk That Talk slipped from three to five. Murs moved up a place in the singles chart to take the number one spot with Dance With Me Tonight. The X Factor 2011 finalists, joined by former boyband contestants One Direction and JLS, slipped a place to number two with their cover of the 1970s Rose Royce classic Wishing On A Star. Dedication To My Ex (Miss That) by Lloyd featuring Andre 3000 and Lil Wayne entered the chart at number three, while We Found Love by Rihanna featuring Calvin Harris and Good Feeling by Flo Rida each dropped a place, to numbers four and five.